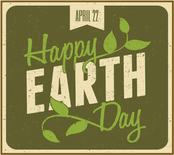 Every day is Earth Day - a day to celebrate and nurture the planet and all of its diversity - but some days, weeks, and months have been set aside to recognize a specific aspect of sustainability. Many of these special days are advocated by organizations that provide information, events, curriculum, contests, and other resources to support and encourage the participation of teachers and students. The dates can shift from year to year. Be sure to let us know how you are observing these special Sustainability Days!